The site was (re) discovered by chance during the Arab revolt of 1920 when British-Indian troops pitched camp. Several well-preserved wall paintings with scenes of the Roman commander Julius Terentius sacrificing to the gods were unearthed in (what was later identified as) the Temple to the Palmyrene Gods. News of the discovery reached James Henry Breasted, archaeologist and founder of the University of Chicago’s Oriental Institute, who was on expedition in Mesopotamia (beyond the Euphrates) at the time. On the 2nd of May 1920 Breasted, together with his colleague Daniel Luckenbill, crossed over from Abu Kamal to devote a day to the site. Breasted’s notes and Luckenbill’s photographs would later appear in the inaugural publication of the Oriental Institute in 1924, Oriental Forerunners of Byzantine Paintings. 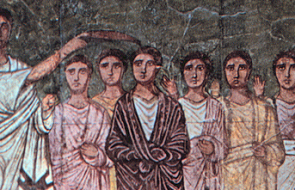 The conclusions would shape discussion about Dura-Europos and its art for decades to come. The site was subsequently excavated by Franz Cumont of the French Academy [1922-23] and later by Yale University under Michael Rostovtzeff, Clark Hopkins and Frank Brown [1928-1937]. During Yale’s tenure the city was identified as the Dura cited in Parthian Stations by the 1st Century Greek Geographer, Isidore of Charax. The identification was secured with an inscription to the goddess Tyche, “the good fortune (tyche) of Dura” within a wall painting from the Temple of the Palmyrene Gods. It was also under Yale’s leadership that the synagogue rose from the dust. It was the most sensational find of the sixth season [1932-33] and arguably the entire 10 year expedition. This was in fact the second of two synagogues built on the same site opposite the Temple of Adonis: a short distance from both the main gate and the House-Church (the earliest securely dated Christian building ever to be discovered). The original and substantially smaller synagogue had evolved from a private house built in the Parthian age; as it was for the neighbouring Christian shrine. Construction began afresh shortly after Roman rule. Concurrent with the developments of other public and private spaces to include the Mithraeum and the House-Church, the synagogue was renovated. It was given a colonnaded atrium and the House of Assembly (the shrine) was enlarged such that it now covered an entire city block in width. The date of the renovation (245 CE) was ascertained from an inscribed ceiling tile with mention of the benefactor, Samuel the leader, Abraham the treasurer and Arsakh the non-Jew or proselyte. The synagogue’s House of Assembly was also embellished as part of the programme. Wall paintings, tempera on plaster or secco (not fresco), were added in 249/250 CE. These covered all four walls in five horizontal bands. At the time of its unveiling in 1932, 40% of those images had been destroyed. 29 panels with just under sixty biblical scenes in three bands awaited; as did peripheral stone benches and an aedicula: a scallop-shaped niche for the Torah built in the western wall (which faced Jerusalem). In diverse hue some of the most prominent narratives refashioned themselves in a very local setting: baby Moses in the basket with Pharaoh’s daughter as a Grecian water nymph, Moses crossing the Red Sea, the binding of Isaac, Saul anointing David, the investiture of Aaron (in Roman toga), Mordechai riding triumphant, Elijah restoring the widow’s son, the capture of the Ark by the Philistines and the defeat of the Philistine god Dagan (and destruction of his temple at Ashdod), are a few examples. Upon the walls were also two sets of inscriptions: dedicatory Aramaic with less abundant Greek and graffiti inked on the “Purim Panel” (with Mordechai) in Middle Persian and Parthian – a “calling card” from unknown visitors.